Proper history, stumbled upon. Not packaged up and neatened, nicely presented, but found lying on the ground, randomly. It was clearly no longer attached to a wall, and displaced from elsewhere. Further investigation revealed that the Brooke family lived on Coney Street. Robert Davies’s book of antiquarian walks around York, published in the late 19th century, says that Montague Brooke was the last of the family to live in the Coney Street house – which was apparently a few doors down from the Mansion House. Mr Davies said that ’some of the leaden spouts at the back of the house still exhibit the punning crest of the Brookes, a brock or badger, with the date 1758, perhaps the only memorial of the family now existing’. I had a look, via the back alleys near City Screen. As expected, there’s nothing now that exhibits the ‘punning crest’. The buildings are all shops, and the downpipes and guttering are plastic. So perhaps this ‘Brooke family stone’ in a forgotten corner of York is the only memorial of the family now existing. Or, it was, a year ago. It may have been displaced again during the recent site clearance. I hope it wasn’t thrown in a skip. Some further information came to light. Montagu’s brother was Sir Job Brooke, who had mental health problems, or, as they said in those days, was a ‘lunatick’. A petition was presented to Parliament by Montagu and his mother Bridget to stop Job from marrying ‘during his lunacy’. He didn’t marry, and the family title is listed among the ‘extinct baronetcies’. So, what about this wall, proudly repaired by Montagu Brooke? There’s a document at the Borthwick Institute – and another copy on the desk in front of me – detailing the case of a dispute over a boundary wall somewhere in the parish of St Michael, Spurriergate, which divided coal yards owned by Montagu Brooke and John Pennock. Perhaps the very wall this stone came from. Seems likely. How it got from Spurriergate to the land at the back of the art gallery is a mystery. The National Archives have the will of Montague Brooke of York, who I assume is the same gentleman, dated 2nd June, 1761. 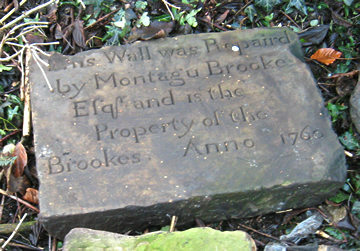 Montagu Brooke died in York, but I’m not sure where he’s buried. Perhaps in the churchyard of St Martin’s, which now seems to have disappeared under the paved approach to the City Screen development. His book collection – “a curious and valuable collection of books : Consisting of several Libraries, and particularly that of Montagu Brooke, of York, Esq ; Lately deceased” – was advertised for sale by J Todd and H Sotheran, booksellers in York, in 1767. A forgotten fragment of stone with an inscription carved in the 18th century. A digital photo and some internet-based research in the 21st century. A website page remembering Montagu Brooke, one-time citizen, with his boundary dispute and his ‘lunatick’ brother and his family’s forgotten title. One of many ‘York Stories’ from centuries past. By Lisa @YorkStories • 10 February 2012 Curiosities, York/Yorkshire, Histories To link to this page's proper location please use the > permalink.